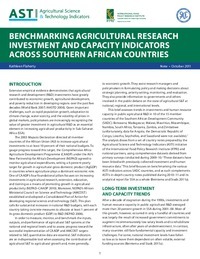 Total investments in public agricultural R&D in the Southern African countries included in this study increased slightly from the 1990s to 2008. Overall, the 2001–08 investment growth in these countries was lower than average growth in other subregions of the continent. With the exception of Tanzania, public research spending growth stagnated or was negative. However, agricultural research in the middle-income countries of South Africa, Mauritius, Namibia, and Botswana was comparatively well-funded by their national governments. These countries outperformed other subregions, as well as neighboring lower income countries, in many key areas. They are less dependent on donor contributions and development bank loans than are the subregion’s low-income countries which have been subject to funding volatility associated with fluctuating allocations and disbursement schedules. Overall agricultural research staffing in the SADC countries has also grown slightly since the 1990s, but not as much as countries in other subregions of Africa. Corresponding to the high agricultural investment intensity ratios, the middle- income countries have high ratios of agricultural researchers to agricultural laborers. South Africa in particular leads the subregion with its well-established agricultural research agencies and universities. In 2008, South Africa employed the highest share of PhD-qualified research staff among the SADC countries (46 percent). Strengthening research capacity continues to be a challenge in most of the Southern African countries, and the lack of local PhD programs particularly limits training in Botswana and Namibia. Agricultural researchers in Mozambique, Zambia, Zimbabwe are among the least highly qualified in SSA given that about half are qualified to the BSc level only. Other countries, such as Madagascar and Tanzania, employ an aging pool of researchers as a consequence of long-term government recruitment freezes, so recently recruited staff are young, less qualified, and often have limited training opportunities.